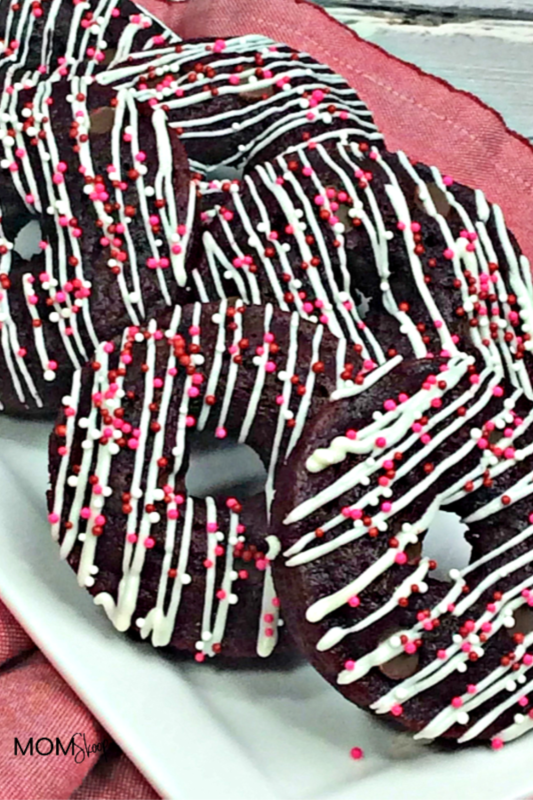 Red Velvet Donuts that are heavenly, made from scratch, and covered with cream cheese frosting! 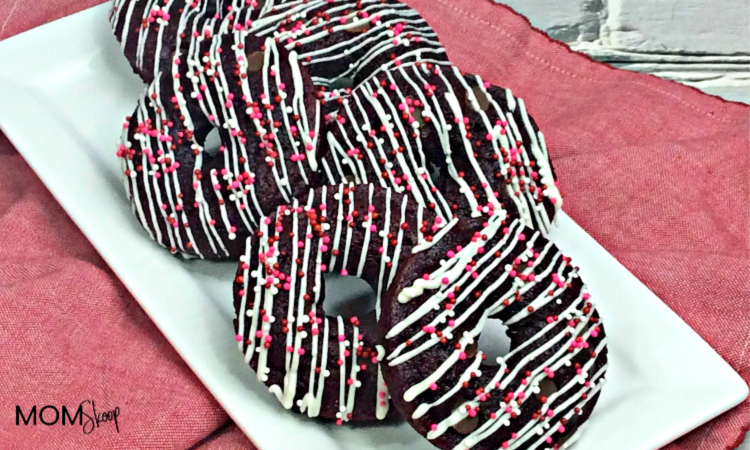 These Red Velvet Donuts are scrumptious warm bites of delight covered in cream cheese. As you bite into them, you will notice an ingredient that isn’t normally a part of a red velvet dessert and that’s chocolate chips. 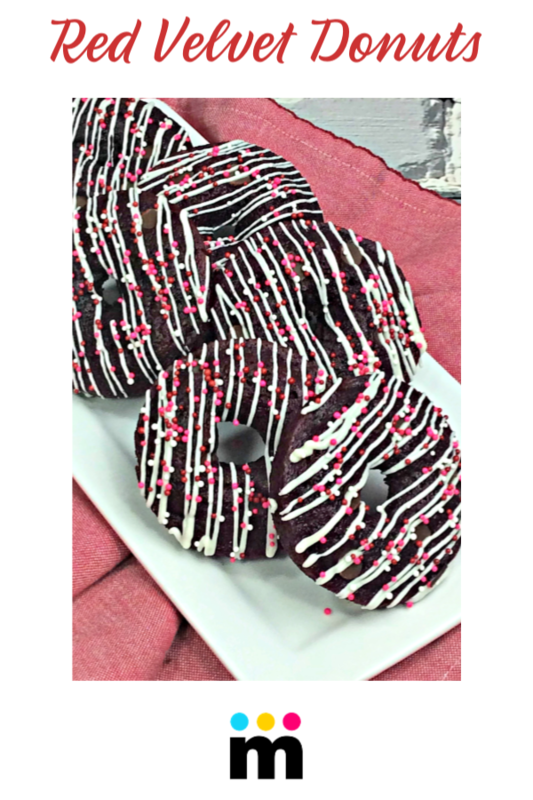 Of course, in traditional red velvet recipes, cocoa powder is used, however, in our Red Velvet Donuts, we use chocolate chips. Another one of my favorite Red Velvet desserts is my Red Velvet Bundt Cake with Cream Cheese frosting. 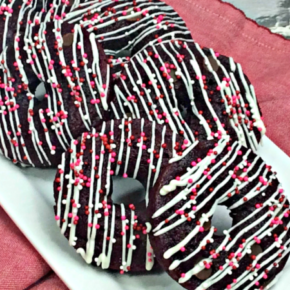 Here is our recipe for Red Velvet Donuts. I must warn you, these are addictive. You will go through them quicker then you think! But hey, isn’t that what life’s about? Enjoying comfort food in moderation? In a large bowl whisk together the flour, cocoa, sugar, baking soda and salt. Using a standing mixer, beat together the melted butter, egg, vanilla, sour cream and buttermilk. Mix in the food coloring and distilled vinegar. Gradually add the dry ingredients into the wet ingredients and whisk until just combined and smooth. Spoon the batter into a large ziploc bag, cut the bottom corner off so there’s about 1/2 inch opening in the bottom corner. Pipe the batter into the prepared doughnut pan. Bake for 8-10 minutes or until the doughnuts feel slightly firm to the touch. Allow to cool for 5 minutes in the pan, then continue cooling on a wire rack. Using a standing mixer, beat the butter and cream cheese until combined. Add in 1 cup powdered sugar and 1 tablespoon of cream or milk and whisk until combined. Add in more powdered sugar and cream until the desired sweetness level is reached. Let sit for a few minutes before enjoying! Spoon the batter into a large ziploc bag, cut the bottom corner off so there's about 1/2 inch opening in the bottom corner. Make sure to pin this recipe now so you’ll have it for later.